Manchester-based property marketing agency Blaze Marketing has announced its expansion into the residential sector with high-profile campaigns for clients including Edgeworth Developments and August Blake. 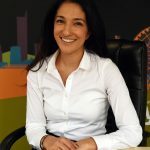 The agency’s presence in the sector will be led by account manager Benazeer Singh, who joined in August. A new residential property micro site has also been launched as part of a wider marketing campaign. Co-founder Daniel Bourmad said: “Since our inception in 2013, we’ve had the opportunity to work with some of the North West’s leading property brands, and have been very fortunate to have had tremendous support from Manchester’s thriving property community.